Yes! 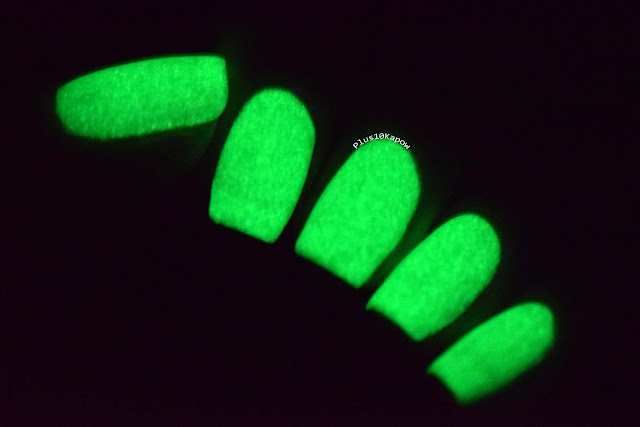 Wikkid Polish is releasing these glow in the dark polishes in March and they are amazing. 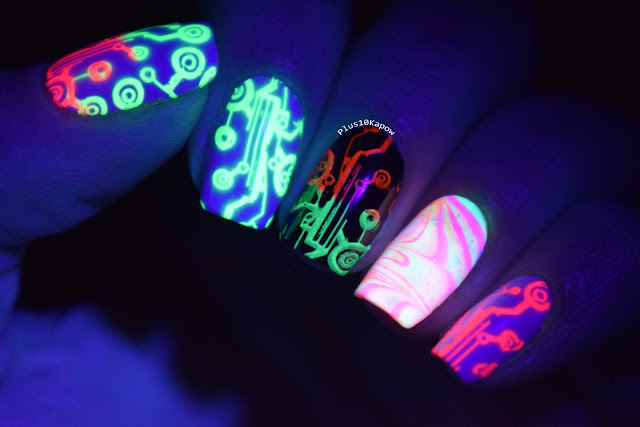 Not only are they glow in the dark but they are also neon and UV reactive!!! This is a pretty photo heavy post, so apologies in advance but on the bright side, more photos means less rambling from me. 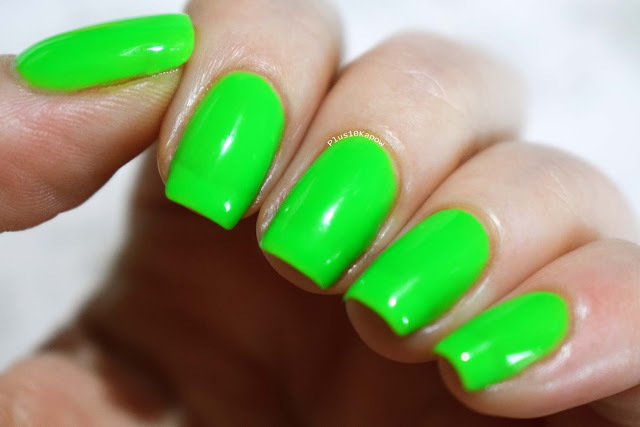 This polish is Greeeen and it is a dream, such a beautiful, lime, neon green. 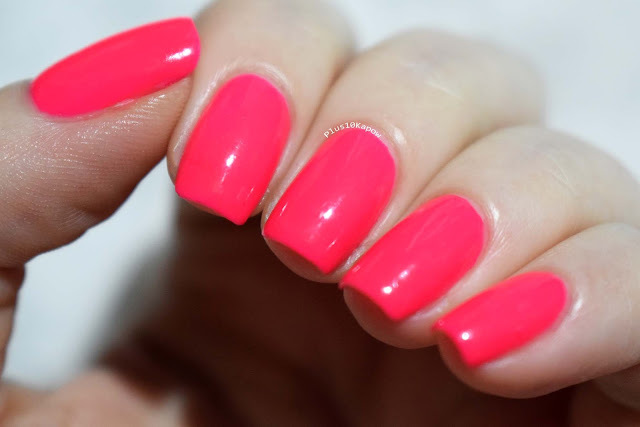 This is 2 coats, no white undies and a coat of Seche. It applies beautifully, dries fast and clean up is surprisingly easy. 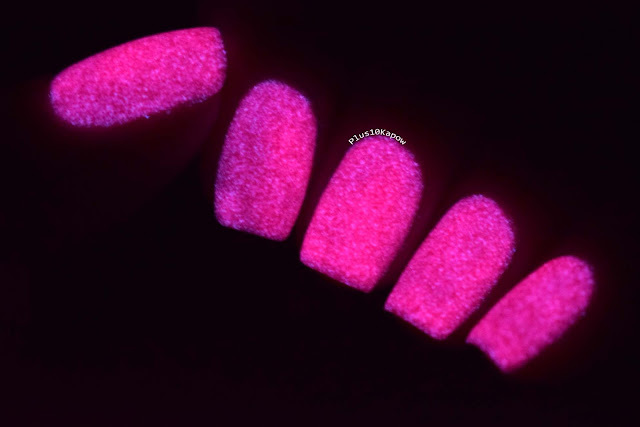 The glow in the dark bits do make it so it dries with an ever so slightly gritty finish, which is barely noticeable but if you want a smooth finish, one coat of Seche does the job. It glows a gorgeous and spooky green. Look at that glow on my thumb and middle finger! Like any glow in the dark thing, it does have to be charged up by a bright light or a UV light to get a good glow on it. I charged mine up with a UV torch before taking this photo. 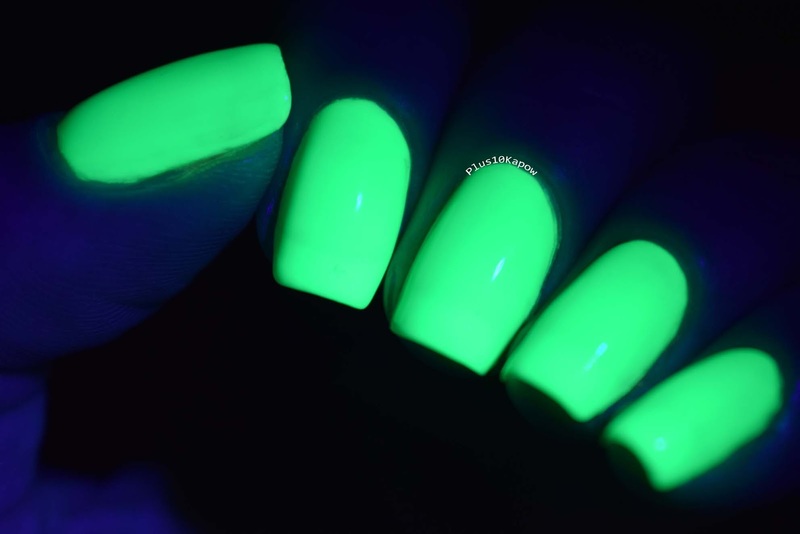 As you can see, the UV reaction on Greeen is also amazing and is a bright, light green almost like a glow stick. This beauty is Piiink. 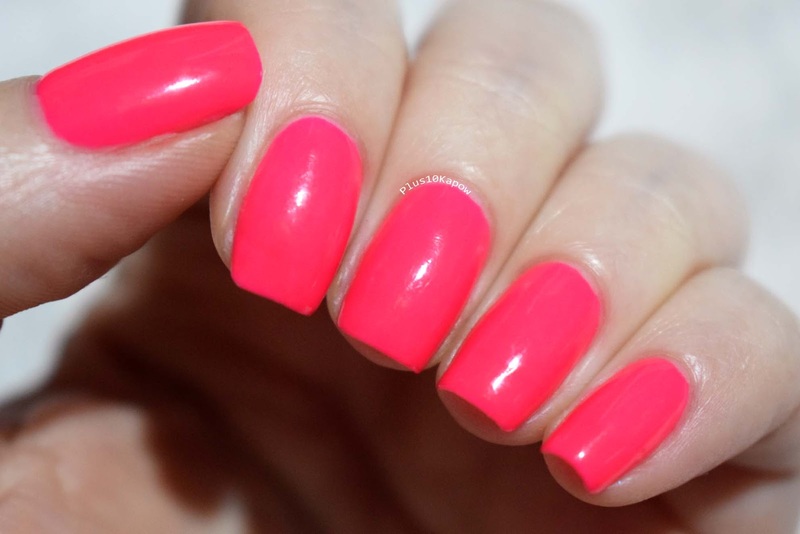 Piiink is my favourite even though I wouldn't normally pick a pink over a green, this one has definitely caught my attention. It's much brighter in real life but I couldn't catch it on camera at all. On the nail, in normal lighting, it almost looks peach toned. Piiink also applied like a dream, with a great formula, I would say it is almost a one coater, and with no white undies either. 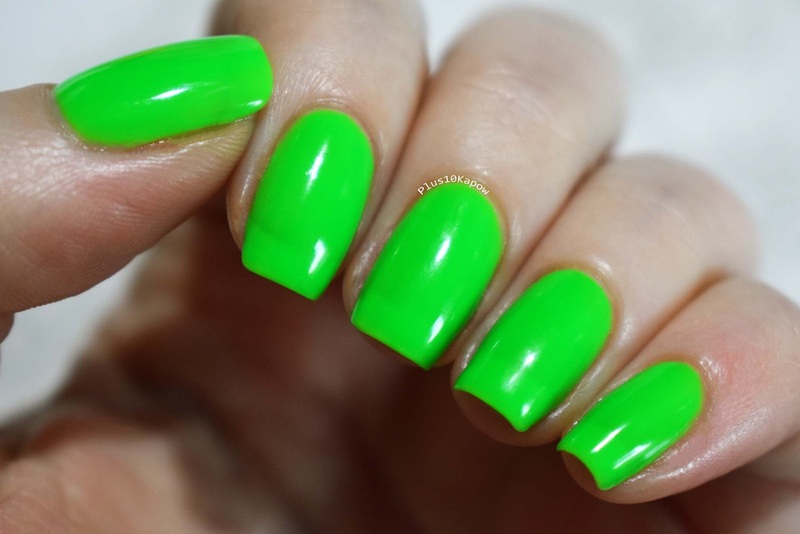 Like Greeeen, it dries fast and to a slightly gritty finish and one coat of Seche sorted this one out too. The glow on Piiink is so fairytale I thought I was in one! it's beautiful and gives a mix of purple and pink glow. Again, I charged this with a UV torch before taking the photo. 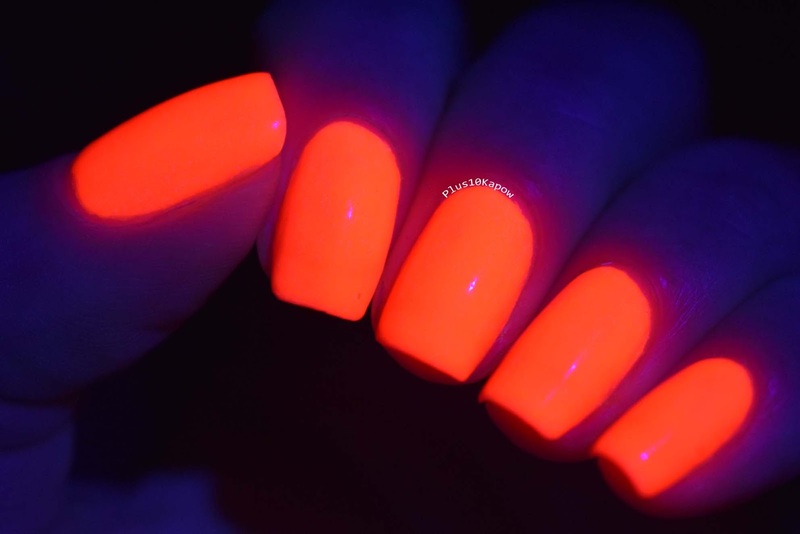 And the UV reaction is a bright, peach toned orange and I died. Look at it! So bloody bright. When Sarah told me she was making neon gitd's, I had an instant idea of a neon gradient, which I did but the colours mixed together made an orange and brown, so not the best of things. 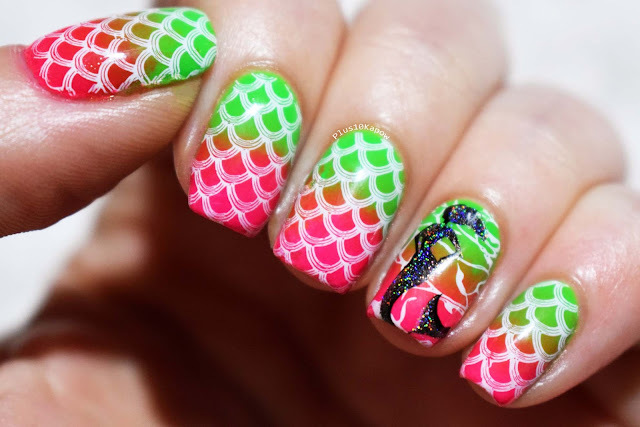 I added some mermaid scales and a mermaid to it because who doesn't love a neon mermaid. But the glow on this made me love it so much more. Look at those two together! I hear you asking it, they are very pigmented so do they stamp and water marble? Well, I can answer both as yes! You can see them above stamped on both white and black, and with a watermarbled finger. 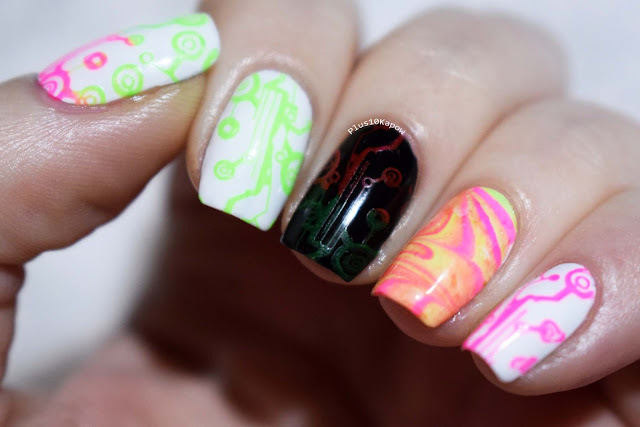 When stamped, they did lose a bit of their glow, especially over the black but the green was the brightest, and how pretty is the glowing watermarble? 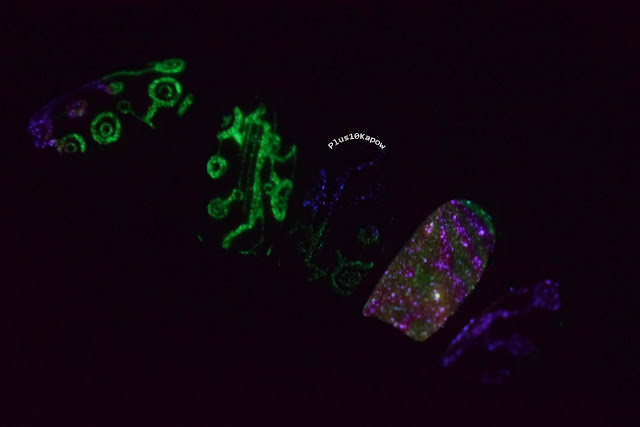 This finished me off, look at the UV reaction on the watermarbled! 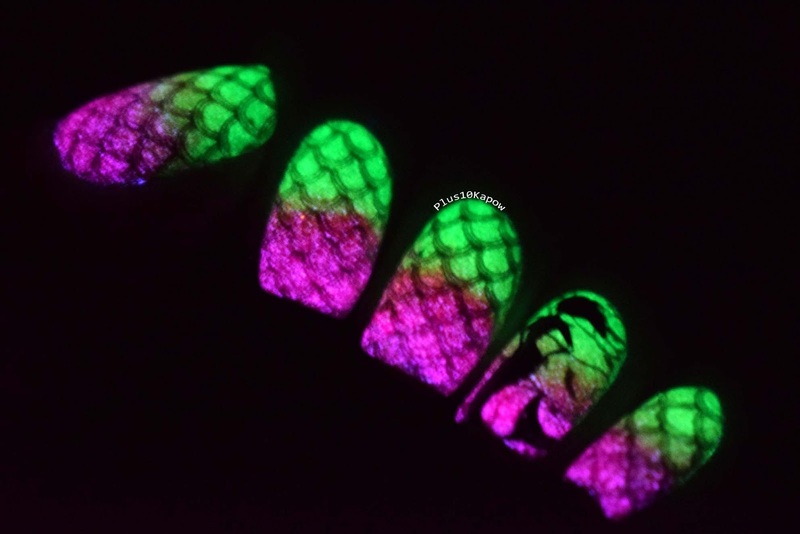 These are great polishes and are a fab addition to Sarah's glow in the dark range. Keep an eye on Sarah's pages to find out exactly what date they are released and see other gorgeous Wikkid Polish creations.